Every petrol engine needs a sparkplug to ignite the fuel mixture. To generate this spark, every cylinder is fitted with a sparkplug. The sparkplug is a part of the ignition system of the engine. This system is controlled by the ECU that signals the igniter to let the ignition coil fire. The ignition coil is a sort of transformer that uses the cars 12 Volts to generate a voltage of 15.000 to 25.000 Volts, needed to let the sparkplugs generate a spark. The Voltage arrives at the sparkplug through a distributor that sends the high voltage from the coil to the right sparkplug lead exactly on the right time that sparkplugs needs to fire. Modern cars don't use distributers anymore and have a separate coil for each sparkplug, reducing ignition parts that can wear or brake. When the sparkplug fires, the high voltage that is send through the central electrode (the positive (+) side) will create an electrical arc between the central electrode and the ground electrode (the negative (-) side). That spark is hot enough the ignite the fuel mixture and start the combustion. Cut-out view of a sparkplug. But something most people don't realize is that besides generating a spark, the sparkplug has a secondary function as well: Regulate the temperature in the combustion chamber. Because the sparkplug is screwed directly into the aluminum cylinder head and protrudes into the combustion chamber, it is one of the few parts that we can use to dissipate the heat generated in the combustion chamber. For a optimal combustion, the engine has to operate at a certain temperature range. This temperature range is also important for the sparkplug itself, as it needs enough temperature to clean itself, but it can't get to hot as the ceramics of the sparkplug could damage. The optimal temperature range for a petrol engine lies between 450°C and 850°C. When the temperature in the cylinder head gets to low, soot and other impurities can cling to the dome of the combustion chamber, valves and the sparkplug itself. When the temperature get's above that 450°C it get hot enough to burn of these impurities. But on the other hand, when the temperature gets to high, it can cause the ceramic to crack or otherwise damage the sparkplug. The only way to control this temperature is to use a sparkplug with the right heat range. This heat range can be read from the code that is uses to identify different sparkplugs. This code doesn't only tell us about the mechanical properties of the sparkplug (which thread, which socket used to install, etc.) but also which heat range the sparkplug has. But this is not a uniform code and manufacturers use different methods and numbers to denote their sparkplug codes. The heat range of a sparkplug is determined by the way it is constructed. 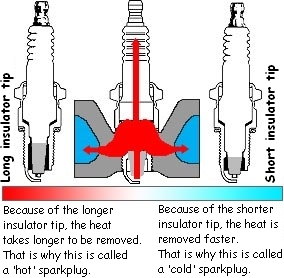 The insulator tip of the sparkplug is the hottest part. It has to get rid of the heat generated by the central electrode, and dissipate it to the aluminum of the cylinder head. Because of the material, the isolator tip can conduct and transfer heat at a certain rate. By varying the size of the material, you vary the speed with which it will transfer the heat to the surrounding material (the aluminum of the cylinder head). The longer it takes, the hotter it will stay in the combustion chamber. The faster it is transferred, the cooler it will get in the combustion chamber. Sparkplugs are self cleaning as well. They can burn of any deposits that form on the insulator tip and central electrode and can disrupt proper functioning of the sparkplug. But for the sparkplug to be able to clean itself, it will have to reach a certain temperature to burn off these deposits. This temperature has to be at least 450°C. But when it gets to hot, the sparkplug might get damaged which might damage the engine itself too. Keeping the temperatures below 850°C also helps also helps prevent engine-knock and pre-ignition. So it's pretty important to select a sparkplug with the right heat range. But how do you know if you are using the right sparkplugs? This sparkplug looks ok. A slightly grayish to brown colorization with a black edge are proof of a good combustion and proper functioning engine. Although it might look bad at first sight, there is no reason to change the sort of sparkplug used here. The sparkplug is just worn out and needs to be replaced. The high electric current starts to burn away the material of the electrodes. This is called spark erosion. A few examples of sparkplugs that have been to hot. Electrodes that are deformed or even molten together. Insulators that look like they were boiled or are even cracked. They're all signs that the temperatures in the combustion chamber are getting to high and a colder sparkplug needs to be installed in the engine. When to cold a sparkplug is used, the black or dark grey color is a tell tale sign. The heat is transferred to fast and the heat in the combustion chamber isn't high enough to burn off any deposits. A hotter sparkplug needs to be installed into the engine. To generate a good spark between the electrodes, the gap between the central electrode and the ground electrode is pretty important. When you buy a new sparkplug, the gap will be set to the correct distance, but it's always a good idea to measure the gap with a feeler gauge. The gap distance is often specified in the engine documentation. The electrodes themselves can be made from different materials. The materials used makes them withstand the spark erosion better. This makes them last longer and have a more even en constant spark throughout their entire lifespan. The central electrode must be made of a good electrical conducting material, but it also has to withstand very high temperatures. A 'normal' sparkplug usually has a central electrode made of a steel/nickel alloy. This is cheap and effective, but depending on how the engine is used they should be replace every 25.000km's. Other materials used for the central electrode are platinum and iridium. These materials are a lot harder and less susceptible to spark erosion. 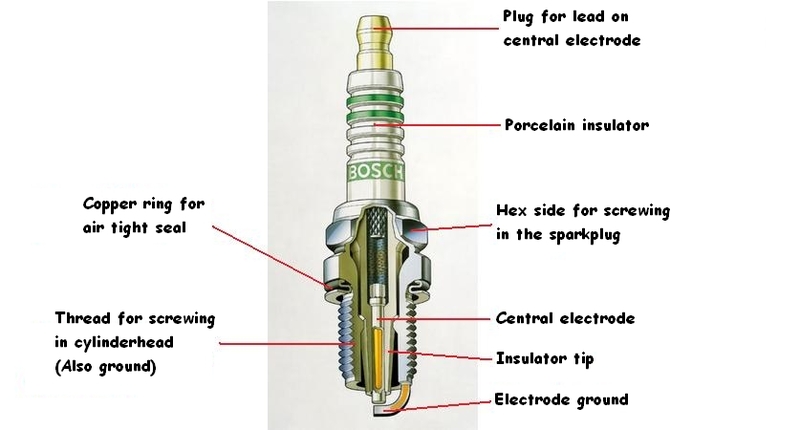 The voltage used to create the spark can also be lower when using more expensive materials, reducing work load on the other ignition parts and the tips of the electrodes of the sparkplug itself. This also reduces the erosion on the electrodes, making them last longer and give a more constant spark for a longer time. And a better, stronger spark helps starting the combustion process and making the engine cleaner and more effecient.